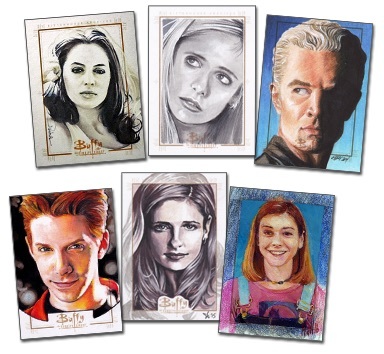 Honoring the 20th anniversary of the series debut, 2017 Rittenhouse Buffy the Vampire Slayer Ultimate Collectors Set Series 3 carries with it a powerhouse lineup of signers along with a steep box price. While the premium product brought Sarah Michelle Gellar autographs in Series 1 and Alyson Hannigan autographs in Series 2, the Buffy the Vampire Slayer Ultimate Collectors Set Series 3 checklist features the BTVS debut for Seth Green autographs. Gold Autographs showcasing gold-ink signatures for Gellar, Green and Hannigan, come two per box. 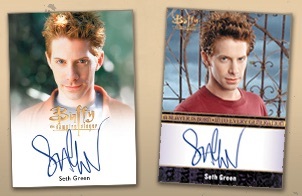 There is also a Full-Bleed or Bordered Autograph for Seth Green in every box set. The final component of each box is the 20th Anniversary Metal Character Retrospective set. These fall two per box with the full set consisting of eight cards. Purchase incentives for 2017 Rittenhouse Buffy the Vampire Slayer Ultimate Collectors Set Series 3 include a Dual Autograph for Alyson Hannigan and her husband, Alexis Denisof, for those that buy two sets. Denisof played Wesley Wyndam-Pryce in Buffy the Vampire Slayer and Angel. In addition, collectors who purchase four boxes get the full eight-card set of metal character cards and a Sketch card. 2017 Rittenhouse Buffy the Vampire Slayer Ultimate Collectors Set Series 3 boxes retail for $499.99. 2 Gold Autographs and 1 Full-Bleed/Bordered Autograph per box. 8 cards. 2 cards per box. 1 complete set earned if you buy 4 boxes. Sketch cards are a 4-box purchase incentive.